Karnataka 2nd PUC Revaluation 2019: Karnataka Board released the PUC/12th class revaluation results on 15th April on its official website, karresults.nic.in and pue.kar.nic.in. Students who have looking for apply 2nd PUC revaluation/re-totaling in Karnataka state can check the results as they are presently accessible on the provided results page. 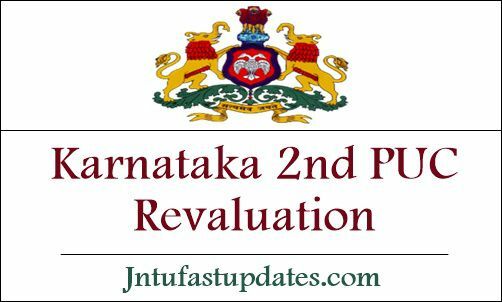 Department of Pre-University Education Department Director C. Shikha announced the Karnataka 2nd PUC revaluation results today. This year approximately 6 lakh PUC Students have appeared for the academic examinations from 1st March to 18th March. While the pass percentage is 67.73 and the Udupi district was topped in the PUC results this year. The second place which tops in PUC results is Dakshin Kannada. After the announcement of Karnataka PUC results, students who have applied for revaluation/re-totaling result can check the result by visiting the PUC result website link provided below. By clicking on the link, students will be directly navigated to the result downloading page and can check the result by providing the hall ticket number, registration number or other details. Students can check the Karnataka PUC II revaluation result branch-wise, district-wise, college-wise and in other provided manners. The result will be accessible to download on KSEEB official page, kseeb.kar.nic.in or on PUC result page, karresults.nic.in. By visiting any of these websites, students can check their PUC II Revaluation results. The revaluation results have been announced for all streams Science, Maths, and Arts. II PUC students who had applied for revaluation can check their marks and grade and can check whether their score got incremented or not. As per reports, a large number of students seeking better marks have applied for recounting, revaluation for various subjects in II PUC. Students will be having the chance to get a good score after revaluation/retotaling. The Karnataka Government announced that this year the revaluation results are being announced before the Common Entrance Test (CET) examination. Hence students who had applied for the Karnataka CET 2019 can initially check their score and attend for the KCET exam. Check the process to download Karnataka 2nd PUC Revaluation result 2019 from the following. Payment page is still down. Throwing 404 error. I have applied for scanned copy through online but i haven't received any mail. So how can i check that my application is confirmed? payment page is still down! Do I need to apply for scanned copies if I want my papers to be revaluated? I had the same problem. You need to reapply. its true fact i agree with u…………. How can I get the copies of my answer booklet? How to get my answer sheets how can appy for revaluation? Re-valuation window has not opened yet. Asgar,how will you help? How I should get my answer sheet to check ? ?